I occasionally have people remark that they can't find information about particular cars here. Since Blogged does not have categories for posts, I'll make some posts myself that will list the cars that appear on this blog and all my previous posts about them. 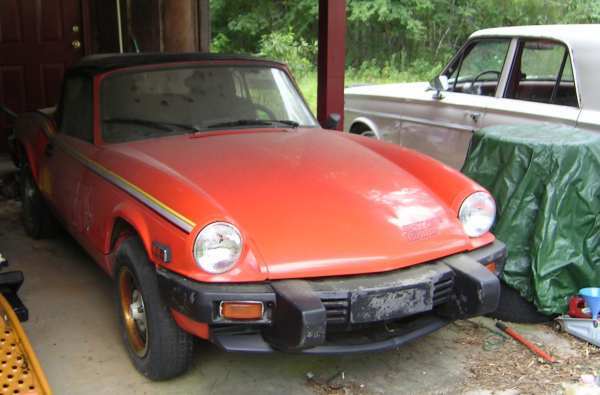 First is an ill-fated project car that recently left my collection, a 1979 Triumph Spitfire. Prior to starting the blog, the car suffered an electrical fire. They don't call Joseph Lucas the Prince of Darkness for nothing. Anyone know the difference is between a 1500 cylinder head and a 1300 cylinder head apart from the valve size?